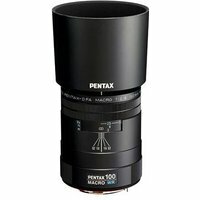 The Pentax 100mm f2.8 SMC D-FA WR Macro Lens has been designed for digital and film SLR cameras and provides a 1:1 life-size reproduction. Its solid weather resistant construction makes the Pentax 100mm f2.8 macro lens reliable enough to use under all kinds of conditions, regardless of your subject; insect or flower photography need never be cancelled due to bad weather. Its maximum aperture of f/2.8 and 8 rounded aperture blades also make the 100mm macro lens ideal for portraiture, while the Pentax Super Protect lens coating and optical elements virtually eliminate flare and ghosting for clear, crisp, high-quality images.